← Pushing Tin: How germs created today’s hot collectibles. 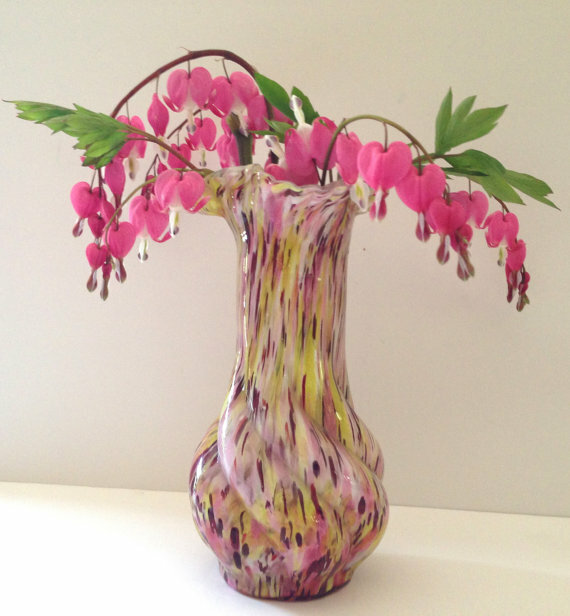 For years, this pretty little vase stood on a shelf in the kitchen of the Janvier Road bungalow. Once in a while I’d pick wildflowers from the woods and place them in it. I always loved it, but didn’t even know what to call the unusual pattern. But after a lengthy search I hit pay dirt. It’s Victorian “End of Day,” or spatterglass. From about 1880 to the early 1900s, America was enjoying the fruits of its first industry: Glassmaking. And Europe, particularly Bohemia and Germany, was also producing beautiful art glass until the 1930s, when WWII put an end to it. When the glassmakers’ days were over, they really started to have fun! They’d gather up the chips of colored glass left over from the day’s work, roll it over a heated metal plate called a marver, and blow the glass into all sorts of shapes. Sometimes, they’d layer translucent glass over that. It’s a technique that goes all the way back to the Romans, referred to as splashed glass! A lot of End of Day is Czechoslovakian; however, American companies made it as well. Any marbleized glass with several colors may also be referred to as End-of-Day. You’ll find such pieces as ashtrays, vases, lampshades and items such as animals, birds and other whimsical designs. End of Day glass is different from slag glass, in which another color is added onto hot molten glass. End of Day glass is still being made. The pieces are often more contemporary in design, and the glass patterns may be different from vintage and antique glass. If you prefer the older stuff as I do, be sure you check provenance. Many of the original artisans didn’t mark their End of Day wares, primarily because they were “afterthoughts” and often designed for the artist’s personal use. Some vintage spatterglass is marked “Czechoslovakia,” and probably came from the Kralik or Welz companies. If you see an “N” it was most likely Northwood. That’s because true End of Day items were made from leftover glass, so it’s difficult to find two that are exactly the same. They’re also available in a staggering array of patterns and colors, making them perfect for just about any decor, both traditional and modern. This entry was posted in Antiques, Collectibles, Etsy, Glass and tagged agate, agates, Akro Agate, Atterbury, Bohemian glass, Bohemian glass EAPG, Brockunier glass, calico, Challinor, Czech glass, Czechoslovakian glass, friggers, Kralik glass, leftover glass, marbles, marver, mosaic, multicolor vase, multicolored glass, Northwood glass, Royal Ivy, Rubina, slag, Spangle glass, spatter glass, Welz glass. Bookmark the permalink. I am so weary of the incorrect use of “end of day” to describe this kind of spatter glass…They made this glass at the factor all day and every day…. True “end of day” glass was something the glass blower made for his own amuseument often to give as gifts at the end of his work day…and real end of day glass pieces are rare and unioque…. John Martin, thank you for chiming in on this issue. 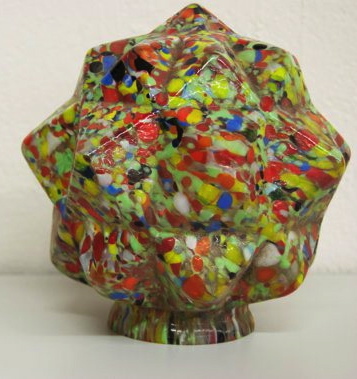 A TRUE “end of day” piece was experimental in form, or made with mixed glass from the day’s blowing or pressing, and was typically taken home and given as a gift as the factory did not care what was done with this remainder material. These examples look far more like art glass pieces than true “end of day” pieces. And many times what people call slag glass were just pieces made with the scrap from the day, typically pressed into molds which were in use that day as a lot of production glass work was pressed glass. So, really slag glass and end-of-day glass are essentially the same items. There is so much confusion about the matter, but I have spoken to OLD men in WV who blew/formed glass and they decry the usage of “end of day” for almost any art glass piece out there that does not fit the styling of pieces created in the factory where they were employed. Their take is true end of day stuff was not this elaborate, using this many colors, etc. It was them playing around after the whistle blew! Also, being a torch glass worker myself, a “marver” means an substance, metal, wet paper, etc. upon which you roll or press the piece to form it or texture it. It is not a specific tool which you pre-heat. Today’s marvers are many times made from blocks of graphite. The “pieces of broken glass” to which you refer are called “frit” and they are typically used as a surface layer decoration for many different glass pieces from beads to vases. Frit can be quite chunky, however it cannot be too large or of a different COE (coefficient of expansion) than the base glass or you risk internal stress in the glass which will eventually cause it to crack. (Sometimes even if you properly anneal it.) Frit, like other canes of contrasting glass can be left raised on the surface or melted in with the piece. The example of the vase from your Janvier Road house has FAR too regular and artistically placed speckling to be merely “rolled in frit”. Also, that piece is englobed, the correct term for covered in another layer of transparent glass, which means more time was spent on that piece than you would imagine. It would not have been something a tired man would have played with while wishing to get home to a cooler, cleaner place at the end of a long, hot, dirty workday. I hope that this sheds some light onto the process and terms. That is wonderful to know – thanks for sharing this important information!